Product Description Warm Latte. Entertaining becomes effortless with the August counter-height upholstered bench in latte. 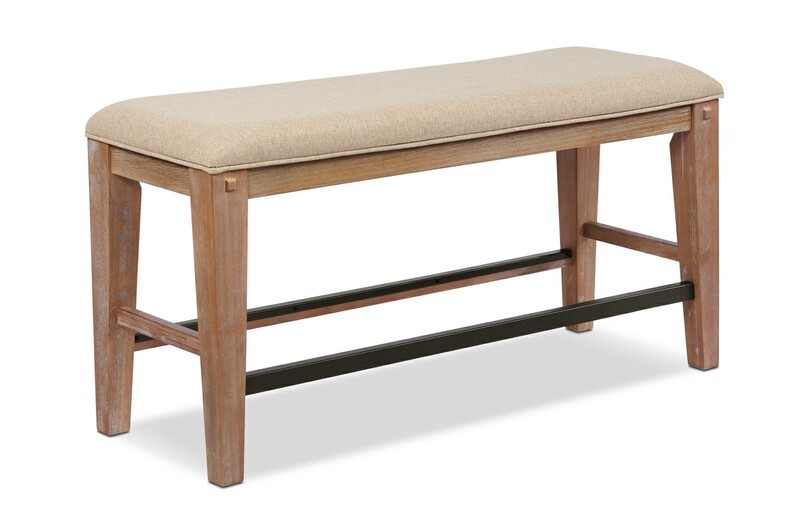 Constructed of durable rubberwood and poplar solids then finished with oak veneers for gorgeous wood grain texture, this bench features an easy to maintain polyester upholstered seat in a neutral linen finish. Metal kick plates are included on the foot rests. Customer assembly required. Unique Features: The brushed oak finish features white highlights. Easy to maintain polyester upholstered seat features a neutral linen finish. Metal kick plates are included on the foot rests. Care Instructions: Spot clean chairs with a mild solvent, an upholstery shampoo or the foam from mild detergent. Petroleum distillate based products may be used as well. When using a solvent or dry cleaning product, follow instructions carefully and clean only in a well-ventilated room.